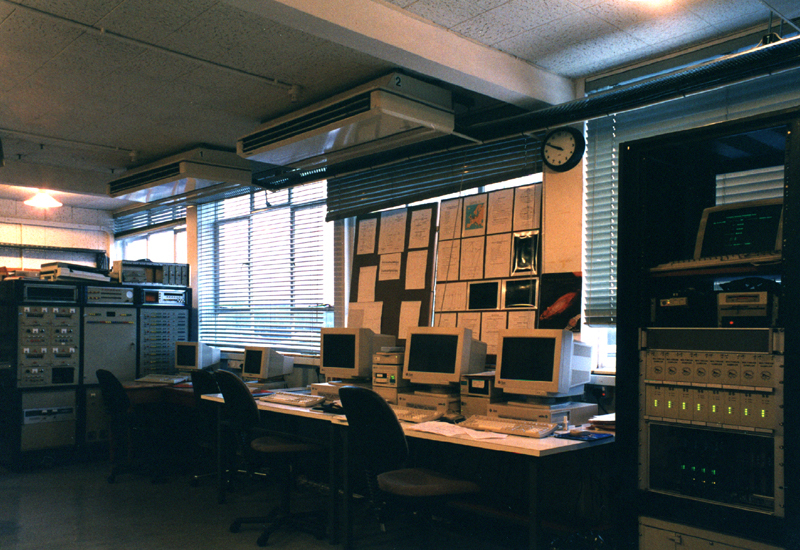 This is where the observations made by the 76m Lovell and 13m radio telescopes are controlled and the radio signals collected by them processed and stored for later analysis. 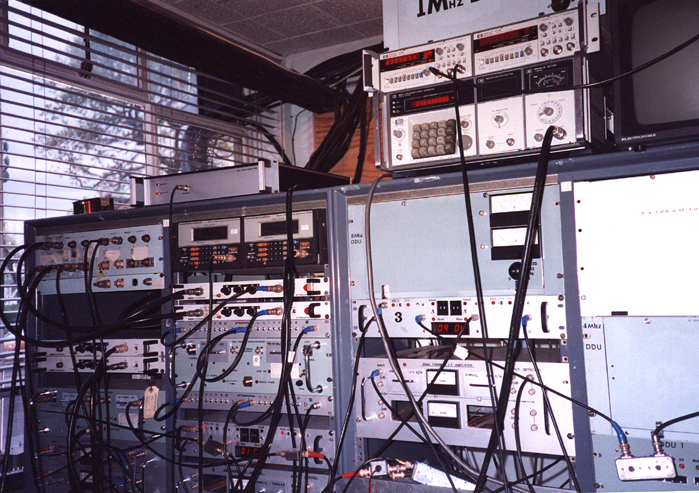 The receiver racks contain a number of computer controlled Frequency Synthesizers (upper left in the receiver rack). These control the observing frequencies used by the telescopes by providing Local Oscillator Frequencies that are sent to the receivers in their Focus Boxes. The bands of frequencies being observed by them are then frequency translated down to an Intermediate Frequency (IF). 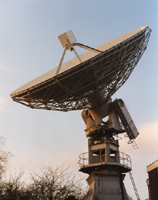 These IF signals, two for each telesope,are then brought to the Observing Room using low loss RF cables. 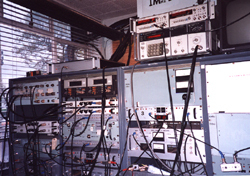 In the receiver racks the IF bands are defined using plug in filter modules and their amplitudes controlled by computer controlled attenuators. What happens to the signals at this point is determined by the observations that are being undertaken, but in every case the final output will be digitised and transferred to the observing room computer, called Arthur. The data is stored on disk and may be plotted out for monitoring purposes. The stored data are regularly transferred onto Exabyte tapes for transfer to the off line data analysis computers. The 13m telescope was one of a pair of telescopes that were brought back from the Woomera Rocket Testing Range in Australia. It is used to monitor the radio pulses emitted by the Crab Pulsar in the constellation Taurus. This object is the remnant of the supernova seen in 1054. A giant star exploded and its central iron core collapsed down to form an object no more that 20 or so km across. The protons and electrons in the interior fused to form neutrons hence the name for this type of object - Neutron Star. Whilst collapsing down, its rotation rate increased to conserve angular momentum and it may have been initially spinning at 50 or more times per second. The result of the rotation of the neutron star's strong magnetic field is the emission of two beams of radio waves broadly in the direction of the north and south magnetic poles. If, as is common, the magnetic field axis is not alligned to the rotation axis, these beams sweep around the sky and may cross the solar system in which case our radio telescopes will detect a short pulse of radio waves each rotation. These pulsating radio sources, called Pulsars, were first detected at Cambridge in 1967. The Crab Pulsar is one of the youngest known and is rotating nearly 30 times per second. As it radiates energy it is very gradually slowing down, and we can predict very accurately when each pulse will arrive. Sometimes,however, our predictions go awry and the the Crab pulsar fractionally speeds up. This, we believe, is due to a very slight change in the deep interior of the neutron star, so by monitoring the minute chages in the pulse period with great accuracy we can actually learn about the interior of a neutron star!